Garage Experts of Southeastern Pennsylvania is a locally owned and operated franchise specializing in epoxy garage floor coatings in the Lancaster County area. Franchise owner Joe Barnhart has worked in the construction industry for over 20 years so a business venture in garage floor coatings and cabinets seemed like a terrific opportunity. Joe’s past experience working with concrete in commercial work paired with his home and small business remodeling expertise is the right combination of knowledge and skills needed to transform an ordinary garage into a well-organized, attractive one. The Garage Experts epoxy floor coating is easy to maintain keeping your garage free of dirt, grime, and dust – ideal for families, car enthusiasts, and people who want to add value to their home. We also offer a line of cabinetry and slat wall for those individuals who desire an organized space. Cabinets and slat wall easily store kids’ toys, sporting equipment, cleaning supplies, car maintenance necessities, gardening tools, and household items commonly found in many garages. 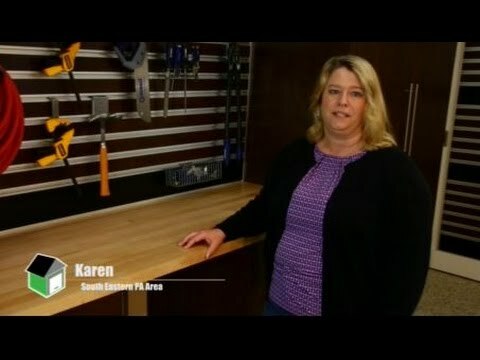 Garage Experts of Southeastern Pennsylvania will design and customize the cabinets and slat wall system to meet your individual needs! Since our Garage Experts franchise is locally owned and operated, customer satisfaction is our number one goal. Joe spent an entire week at the corporate headquarters in Anaheim, California mastering the techniques used to apply this unique floor coating which comes with a lifetime warranty. Garage Experts of Southeastern Pennsylvania serves Lancaster, Dauphin, Lebanon, and York counties and beyond! GarageExperts of Southeastern Pennsylvania is your local garage makeover expert. View some of our recent work.